So this past weekend was marked by the beginning South by Southwest, and that means one thing. SXSW GAMING EXPO! It was a lot of fun being able to test all of the games. 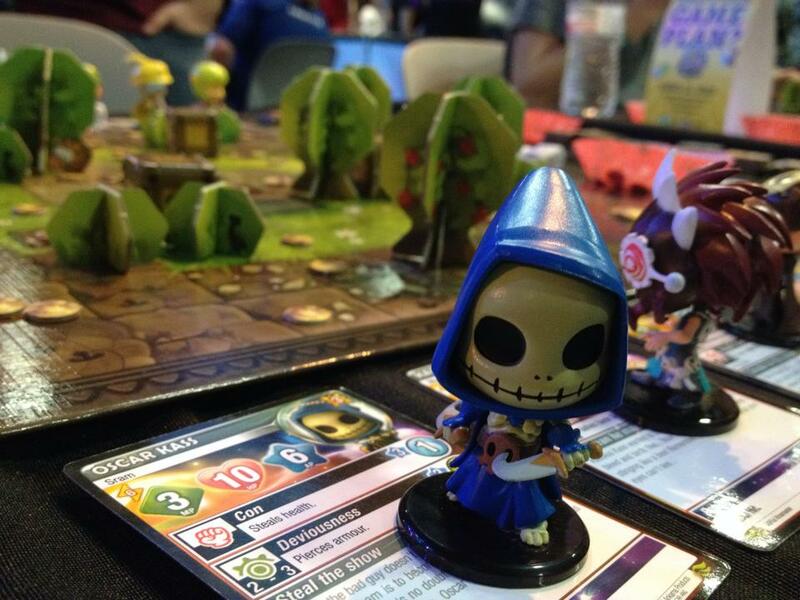 Despite there being a great presence of video games, the board game creators definitely had a presence. I was able to test a game I’ve been wanting to try out, Krosmaster Arena. It’s a grid based strategy game, similar to the video games Fire Emblem, Advanced Wars, or Final Fantasy Tactics. So this is my personal review I can give it, given the beginner game, and the beginner tournament I was able to play in! This game…I’ve been trying to play this game since the 2014 SXSW Gaming Expo, where I first learned about this game, but I actually haven’t been able to play it for the entire year since then. But I was able to luck out this expo! The makers had a booth and a demo table by Geek and Sundry’s gaming center. After sitting down, we were given a run down on the rules and had a demo turn of play. So it definitely is an interesting game, but it’s not really for the impatient. There’s a lot of rules, and turns can be very complex, including a great deal of strategy. The rules can be understood, but it takes a very slow game, lots of questions, and someone who already knows the games to help. You spend your turns moving your characters, attacking, and doing any possible actions. You win by getting rid of all of your opponents “GG” tokens, or “Gallons of Gold”. There’s a few different ways to get rid of them, leading to different strategies! After that first game, I made the awful greaaaat decision to play a full tournament for like three hours after that! I won once, lost once, and tied once, to come out 5th place out of 8. Fun to play, but mentally exhausting. I definitely had a blast, but I don’t think I’ll be able to play Krosmaster Arena for another month or so. 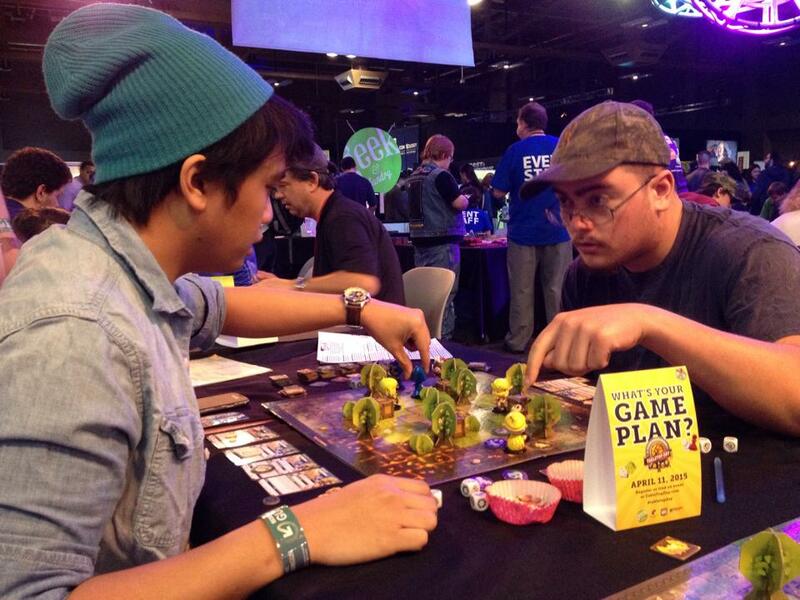 I’d definitely recommend it for people who love strategy games, and anyone who plays a MOBA, or loves strategy games! The items are totally a necessary part of play, and it feels like a character build in DOTA, or League of Legends, and I probably would have lost more if not for them. Definitely not for anyone looking for a casual party game, or something along the lines of Settlers of Catan. The rules take a few games to master, and I would definitely think it would take some dedication to learn. This guy was awesome in my games. Lifestealer + heal! The rest of the expo came with some new, quite exciting things, especially in the Virtual Reality, wearables, and new video game areas. 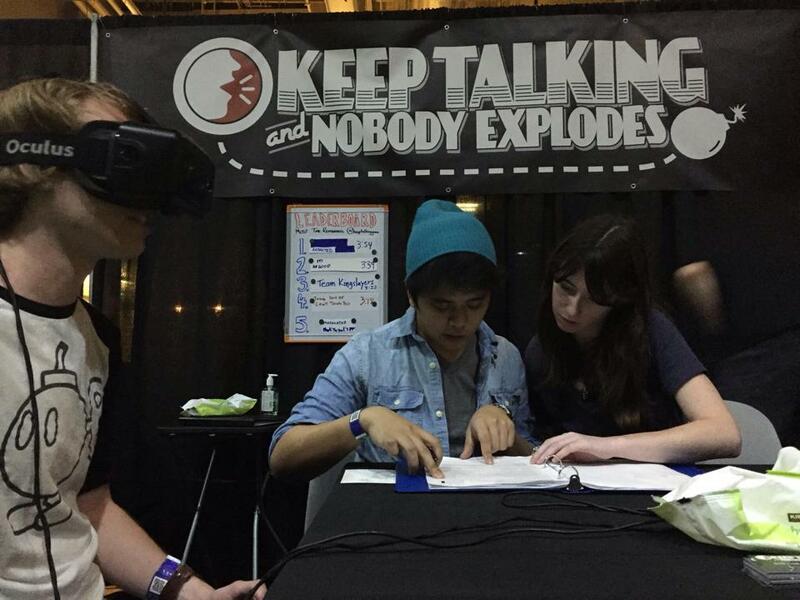 I played a fun virtual reality game, “Keep Talking and Nobody Explodes“, which is a game that lets one of your friends put on an Oculus Rift, and describe a virtual bomb, while their friends walk them through a series of possible steps to defuse it. Get a step wrong, and the bomb will detonate! The demo gave us 5 minutes, and we were able to defuse our bomb! There were some other really cool things, but they were very run of the mill video game expo stuff, Oculus Rifts, Indie games, and new peripherals. I love game expos, and I’m definitely looking forward to finding new games at future expos and conventions! Shoutout to Melissa DeVarney for taking these awesome pictures!